Traveling to Lisbon? Day trip to Sintra is an absolute must! You have probably seen photos of Sintra spread all over the instagram. Well there is no doubt that Sintra is Portugal’s Wonderland. What to mention first? The picturesque views or the palaces that look like they were subtracted from fairytales? Or the mysterious passages that take you to some really well hidden gems you didn’t know exist. If you want to visit Sintra, we highly recommend you to get up really early because Sintra is such a beautiful place and you need at least a day to discover it. Before visiting Sintra, you should do a research about the castles and palaces it has there because it is very difficult to visit all of them in just one day. Each palace could easily take from 1.5-2 hours so our suggestion is to visit 2 of them that you liked the most. Take the train from Rossio Train Station. That is the most convenient and cheapest option as it is only €4.45 with a return ticket! The ride takes approximately 40 minutes and the train leaves every 30 minutes. When you arrive to Sintra, you will have to decide how you will move around the area. The day pass for buses in Sintra costs €12. If you buy a one way ticket it costs €5.50 but you can also walk to the palaces as walking around Sintra is really refreshing and the beauty of this magical town is marvelous. 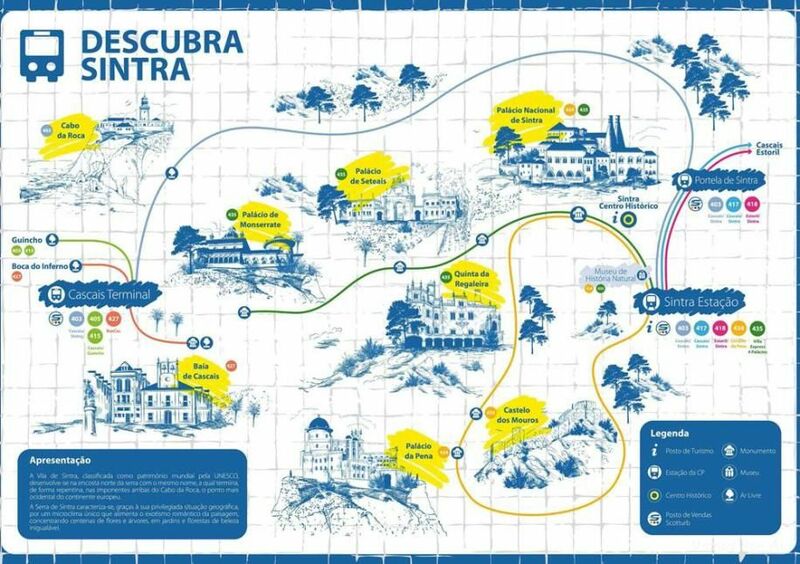 The following map is available for free once you arrive to Sintra’s Train Station. It shows you which bus goes to each palace or monument. Take advantage of the short time you have in Sintra by researching the places so you can decide which ones are the most interesting for you. It looks like this beautiful palace came straight out of a kid’s fairytale. Pena Palace was built in 1854 and it was meant to be a palace during summer for the royal family. It is definitely the most iconic palace to visit in Sintra and the one tourists visit the most. Besides the colorful building, the interior is also really interesting as you will see how the royals used to live. The ticket to the Pena Palace costs about €14 for an adult and €12.50 for a child. Quinta da Regaleira is a decorative residence of the 20th that has a gothic style but what is really special about it are the gardens that are waiting to be discovered. There are so many hidden gems as well as hidden tunnels that take you to some really beautiful spots in the garden such as the Initiation Well. The entrance fee is €6 for adults & €3 for kids. That’s right! Did you know that Cabo da Roca is the most western-most point in Europe? It has a really dramatic landscape, some really high cliffs that are overlooking the Atlantic Ocean. It is also very windy and cold so don’t forget to take your jacket. You can enjoy the perfect views and the relaxing scenery and its really worth it. Take the 403 bus from Sintra to Cabo da Roca. The ride takes approximately 40 minutes to get there so put that into consideration before going. You can also see one of the most beautiful sunsets in Portugal on that spot. …the layers of history in beautiful Sintra, walk through the fairytale-like castles and get lost in the magical forests to reveal the secrets of this ancient town. Taste the local dishes and do not forget to try Queijadas de sintra that are one of the most loved sweets in Portugal and take the most beautiful photos you will ever take in your life.